Hey there Tampa Bay! Lisa back, with some Tampa Florida News. 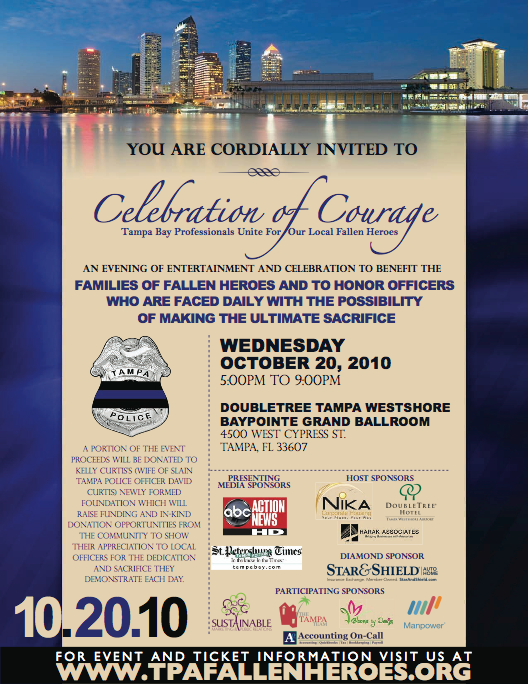 On October 20th from 5-9pm, the Doubletree Hotel Tampa, is hosting the Celebration of Courage. This event supports the Tampa Fallen Heroes Fund; which benefits families of local and fallen officers, as well as honoring officers who are faced with the possibility of making the ultimate sacrifice. Since this is the first major fund raising event for the Fallen Heroes Fund, it is sure to be packed with Tampa Bay Entertainment. It will also be a great opportunity to do some local networking with other Tampa Bay professionals. So lets talk details. There will be speakers, food, drinks, and a silent auction. There are silver, gold, and diamond ticket levels; each offering something a little different. The silver ticket is $35 and includes admission, and unlimited food at the chef stations. The gold ticket is $100 and includes admission, unlimited food, two beverage vouchers, 5 raffle tickets, $10 to Players Sports Pub, and a Thank You package valued at $200. And lastly there are the diamond tickets. Only 130 are available and they include everything I&apos;ve listed plus a Grand Gala 3 course dinner, and a premium hosted bar. There are also other sponsorship opportunities available. Everything sounds great, and all of it goes to a wonderful cause. The Doubletree hotel is located in the Westshore District, near the airport and International Mall. So get out there Tampa and enjoy this Tampa Bay Area Event!